Hi there ! I think I’ve mentioned before my love of breakfast and my disdain for cereal or porridge. So here’s my compromise. It’s quick and tasty and will allow you to have filling breakfast on the run if you’re short on time . 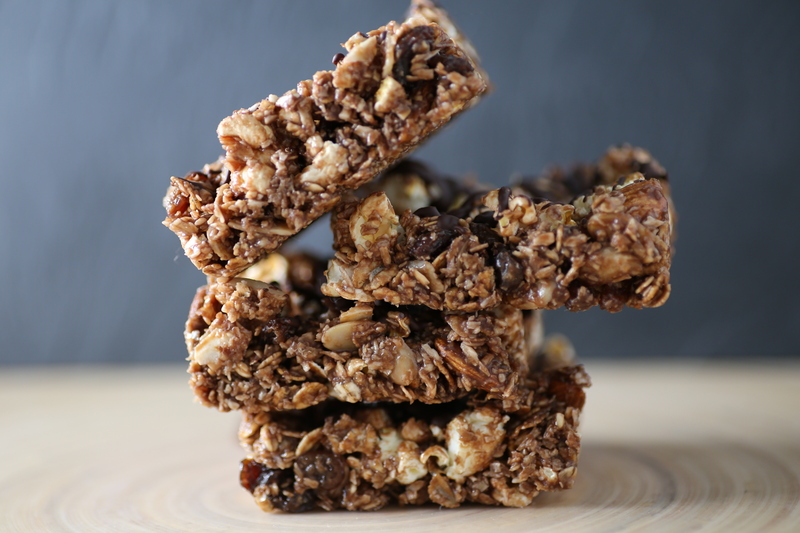 These breakfast bars are so easy and you can pretty much throw in any type of cereal or dried fruit , and of course chocolate and it will taste delicious! Make a batch on Sunday evening and it will last you well into the week, alternatively it’s awesome as a little snack when you’re at work or anytime really ..great with a cuppa. In a large bowl mix in all ingredients except the honey and sugar. In a saucepan heat the honey and sugar until the sugar has melted . Add the melted sugar and honey mixture to the bowl of dry ingredients and mix thoroughly so that everything is covered with the honey mixture . In a pan lined with baking parchment, with enough parchment over the sides so its easy to take out once set. Pour the mixture into the pan and press down firmly on top so it is all even and the stuck together. If you like a little more chocolate then you can drizzle some melted dark chocolate over the top for a little extra sweetness. Refrigerate for a couple of hours or overnight. Then remove from the pan by picking up from the parchment paper and then cut into squares / bars / chunks. See so easy!